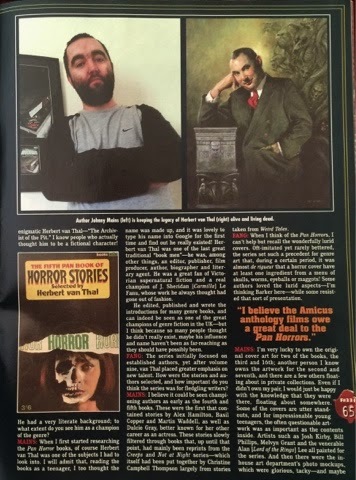 The Universe works in mysterious ways...while out on a weekly book hunt, I came across a relatively current issue of Fangoria Magazine (#331). 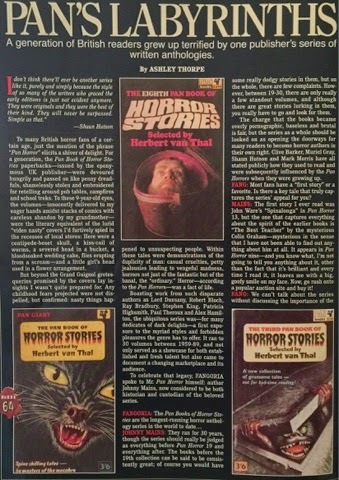 I have always known about the mag, but for some strange reason never delved into its bloody pages before. Tossing it into my overflowing basket of new purchases, I couldn't wait to curl up with my cuppa and devour it cover to cover. As is my modus operandi, I tend to gravitate toward things that are off the beaten path so to speak...or in other words, rare and collectible. 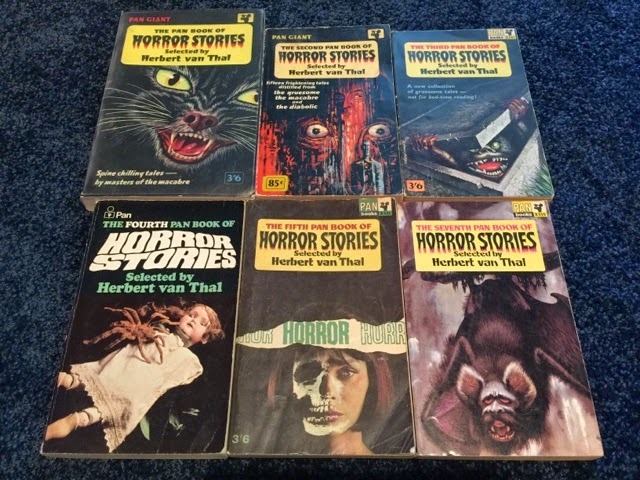 And these Pan Books of Horror Stories certainly are that. Finding them here in the States is quite a challenge at best, even with sites like Feebay and Amazon at our fingertips. 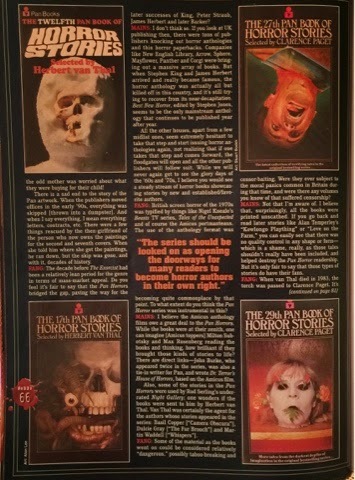 But the hunt is part of the attraction for me, I love the challenge of acquiring rare titles that will entice my customers, while helping to keep alive the love of the horror anthology--back when they were at their best. Sadly, they do not make cover art like these anymore, haven't done since the 80's. And while they say you shouldn't judge a book by its cover, it's almost always a deciding factor for me, especially now that I have a specialty website featuring these amazing little treasures. Perhaps one day I might publish one myself, one never knows. But until then, I will continue to build my evil empire (not so evil, really) upon bringing you books like these in the hopes that others will turn their heads away from the spoon-fed NY Bestsellers lists and try something a little bit different. My collection as of July 2015. 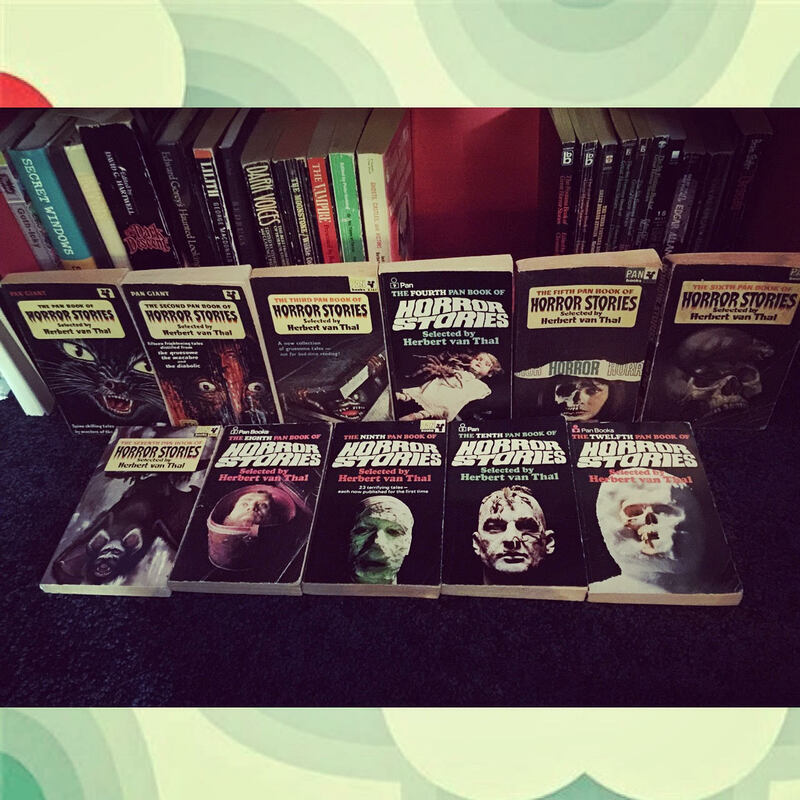 Volumes 1-12 minus #11. Originally, I was only going to collect the first 10, but when you come across #12 for $5, you buy it.